A 42‐year‐old man presented with nausea, vomiting and periumbilical abdominal pain of a few hours' duration. Patient also had nonbloody diarrhea. He denied viral prodrome, sick contacts, recent travel, food poisoning, or any recent antibiotic use. Medical history was significant for TB adenitis (treatment completed) and HIV, with last CD4 count of 28 and viral load of 13,949. Vitals were within normal limits except blood pressure of 87/58. Physical examination was significant for tenderness around the periumbilical region and in the right‐lower quadrant. Bowel sounds were absent. Initial lab work was significant for hyponatremia 125 and hypokalemia 3.0. CT scan of the abdomen with contrast showed a long segment of small bowel projected into the lumen of a distended mobile cecum consistent with large ileocolic intussusception. It was also noted several areas of nodular thickening in the gastric wall, small bowel, and ascending colon. Differential diagnosis at that time was tuberculosis, lymphoma, and Kaposi's sarcoma. During the hospital course, patient was treated conservatively with nothing by mouth, IV fluids, and nasogastric suction. EGD showed a greater curvature mass with ulcerations and esophageal candidiasis. Biopsies show Kaposi's sarcoma and tumor cells were positive for human herpes virus 8. Patient's symptoms improved with conservative management, and he was discharged on HAART therapy. Two weeks later, the patient was readmitted to our hospital with similar symptoms. Repeat CT scan showed recurrent ileocolic intussusception. Small‐bowel series showed incomplete small bowel obstruction with spontaneous resolution of intussusception. Patient was discharged to continue HAART therapy, and taxol chemotherapy on a weekly basis was added to his management. Kaposi's sarcoma (KS) is the most common neoplasm in patients with acquired immune deficiency syndrome (AIDS). Gastrointestinal involvement with KS commonly occurs in association with cutaneous lesions or lymph node involvement, with gastrointestinal tract involvement alone occurring in only 3.5% of cases. There are several case reports described in the literature about asymptomatic intestinal KS with skin manifestations. Our case is unique, in that the patient does not have skin manifestation, and also is that the first manifestation presented as acute intestinal obstruction with nodular mass of the stomach. Initiation of HAART is usually associated with a regression of KS. Taxol chemotherapy in conjunction with HAART can particularly be effective to control the symptoms of immune reconstitution inflammatory syndrome (IRIS). Our case illustrates the importance of physicians of recognizing gastrointestinal Kaposi's sarcoma as a differential diagnosis for patients with recurrent abdominal pain. It is commonly occurs in association with cutaneous lesions or lymph node involvement and rarely presents with GI involvement alone which is makes it a challenge to the physician. 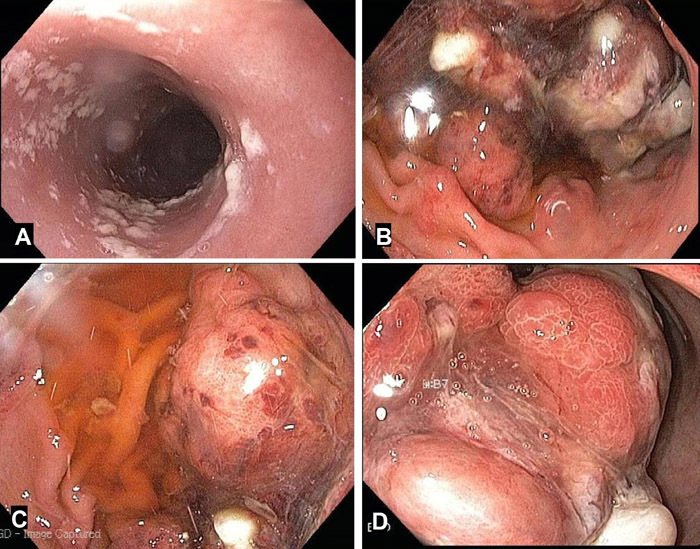 Esophagogastroduodenoscopy (EGD) shows esophageal candidiasis (A), large masses at greater curvature of the stomach with ulcerations (B), mass at junction of body and greater curvature of stomach (C), and mass at the fundus of the stomach (D). Nidimusili A, Shaheen K. Gastrointestinal Kaposi's Sarcoma Presenting As Ileocolic Intussusception. Abstract published at Hospital Medicine 2013, May 16-19, National Harbor, Md. Abstract 306. Journal of Hospital Medicine. 2013; 8 (suppl 2). https://www.shmabstracts.com/abstract/gastrointestinal-kaposis-sarcoma-presenting-as-ileocolic-intussusception/. Accessed April 25, 2019.